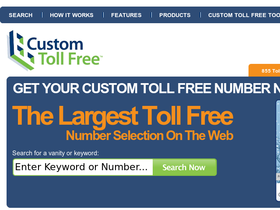 Custom Toll Free at CustomTollFree.com can help you set up a custom toll free phone number for your business. Custom Toll Free makes searching for a toll free phone number easy by providing a searchable database to see if the phone number you'd like is available. Custom Toll Free also provides free voicemail, free online fax service, free online account management and much more! Be sure to stop by 58Coupons for Custom Toll Free coupon codes, Custom Toll Free promotions and Custom Toll Free discounts. Use this code and get your first month of licensing from Custom Toll Free for just just $1! Click link and use code. Visit Custom Toll Free and search their database free to see if your custom toll free phone number is available. Click link. Use Custom Toll Free and take advantage of their free live chat always available to help you with any questions. Click link and sign-up today. Visit Custom Toll Free and reserve up to 855 numbers before they become available. Click link for more details.